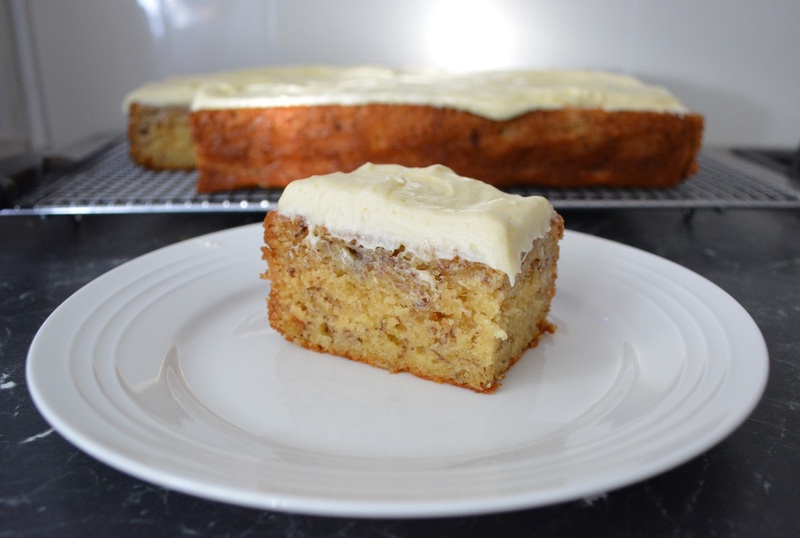 Over the years I have made a few banana cakes and although they were okay, I rarely made them twice and they definitely were not worthy of making it on to What's Cooking Ella. The other day I noticed a few bananas going very brown, they looked like they should be thrown out, they were that bad, so I thought I'd better make some banana bread. But last minute I decided to look up a banana cake recipe instead. I came across this one and it was called a Crazy Banana Cake. So I read the recipe and found it strange for two reasons. One, the cooking temperature is quite low at 135C and two, she places the cake into the freezer as soon as it comes out of the oven. Now my freezer is always quite full so I knew I wouldn't be putting it into the freezer, but I thought I'd put in the refrigerator instead. I assumed they do this to stop the cooking process as fast as possible. Well, this banana cake was amazing. It is so tasty and so moist. It makes for one large delicious cake. Now I am a fan of buttermilk, I absolutely love cake recipes with buttermilk, now I'm not sure why, but I just find they always taste better. And as my daughter has been in the kitchen recently making buttermilk pancakes, I was all out of buttermilk. What to do, I was too lazy to go to the shops, so I made my own, it is really simple. To 1.5 cups of milk add 1 1/2 tablespoons lemon juice, allow it to sit for 10 minutes and voila, you have buttermilk. 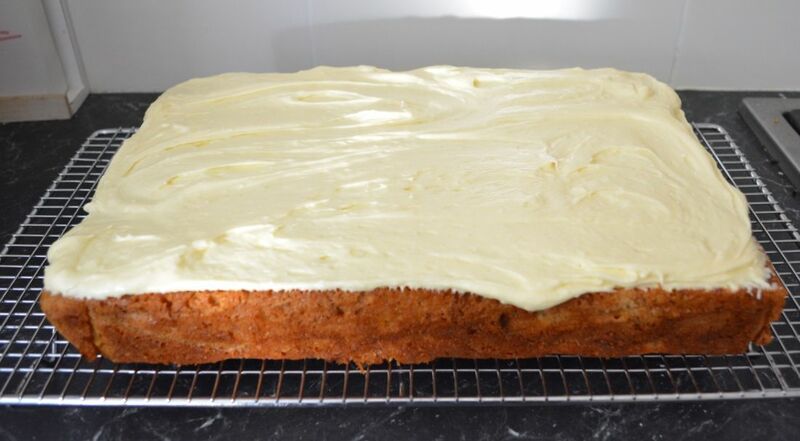 One major change I made to the recipe was I cut a large amount of sugar out of the icing. The original recipe used 3.5 cups icing sugar, I couldn't do that, it would be way too sweet for me, so I stopped at 2 cups of sugar. So the sweetness is up to you, stop once you are happy with the flavour and it is thick enough to spread. Don't be tempted to use fresh bananas, it just isn't the same. So from now on there shall never be a banana thrown out. If you don't have 4 bananas overripe at one time, freeze what you have until you have 4, then make this, it will not disappoint. Preheat your oven to 135C/275F. Grease and line with baking paper a 22cm x 33cm x 5cm cake pan. If you are making your own buttermilk, do so now. Place 1 and 1/2 tablespoons of lemon juice in a large measuring jug, top up with milk to make 1 and 1/2 cups milk. Give it a stir, leave for about 10 minutes. If you bought buttermilk, ignore this step. Mash the bananas with the lemon juice in a medium bowl, set aside. In another medium sized bowl add the flour, baking soda and salt, give it a quick mix to combine. Set aside. In a large bowl add the butter and sugar, mix until well combined, takes about 3-4 minutes. Beat in the eggs one at a time, make sure the eggs are mixed in well before adding the next egg. Stir in the vanilla. Add half of the flour mixture and half of the buttermilk, beat in on low speed until just combined. Add remaining flour mixture and remaining buttermilk, beat on low speed until just combined. Using a spoon now, stir in the mashed bananas. Pour the cake mixture into your prepared pan. Bake for 1 hour and 10 minutes or until a skewer comes out clean in the centre of the cake. You may need to cook it a further 10 minutes, depends on your oven, I start checking at 1 hour, then every 10 minutes after that, until the cake is fully cooked. Place a cake rack or tea towel on your refrigerator shelf (so the hot tin doesn't go straight onto your shelf) and place the hot cake straight into your refrigerator for about 1 hour. After 1 hour your cake should be cool enough to ice. Cream Cheese Icing: Cream the butter and cream cheese, until creamy and smooth. Beat in the vanilla and 1 cup of icing sugar on low speed, when the icing sugar is completely incorporated add the second cup. Now that is enough sweetness for me, but if you want it sweeter add another cup of icing sugar, I just can't do that, too sweet for me. Ice the entire cake and serve at room temperature. If you are not serving it straight away I would refrigerate it until needed. But take it out of the refrigerator 30 minutes to an hour before serving to come back to room temperature.